Good Morning to you! In the love of Jesus, I Hope that you are enjoying the blessings of this wonderfully made day! I tell you, the Lord is moving us forward and it's time for us to Step on into the Way He is guiding us to Step! Remember, that He is always working in us to change us into His Love, to be a reflection of Him, and to mirror The character and the work of Jesus. 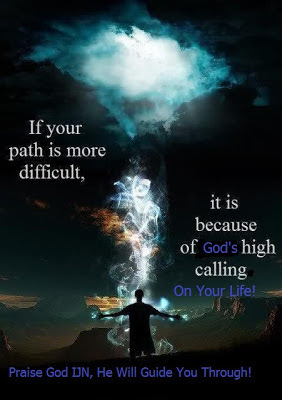 Those who have a High calling on their lives from God, know that it is sometimes a hard road to journey on day by day. There are times when all we can do is scream out "No, Lord, I don't want to do this anymore!" Dealing with those who walk away, thinking we are crazy, those that refuse to help us, those that do everything they can to discourage us, all of this trying to pull the life out of us. And these are the ones we know, our friends and family. I've not even touched on the people we don't know, that we are sent to help, who do some of the same things to us. Dealing with the ills and wrongs of people in this world and it's shallowness, it's violence, it's lack of respect for life, and it's lust to confuse and lie to so many, always trying to pull as many down and keep them down as possible. God's high calling on one's life is a burden to bear sometimes somewhat heavy, somethings lighter. But in the name of Jesus I thank God that Jesus gave us His yoke to carry. I thank God that the Holy spirit reminds me to check that yoke to see what I have added to it that does not belong. I thank God that He helps us with His Work, truly we cannot do it by ourselves. All the challenges, troubles and difficulties that we face on any given day, all the doubt and fears we need more of His grace to help us with on any given day, are because of the High Calling He has chosen us to grow through for His Purposes. God's work of separating us from worldly thinking, things, and people can tire one out! These are the times we Need to go to Him often, prayerful, full of praise and appreciation, to be renewed, to be restored, to be re-filled with all that we need. He strenthgens our spiritual life every day through these temporal experiences. Jesus already taught us that we will have to seek God's presence as often as necessary. That place where we are quiet, Resting in His peace, allowing Joy to lift us up higher and pull us deeper into His love for us. That place where we leave our cares, and concerns with Him. He is strengthening our relationship with Him. What ever will create a crack for the enemy to come in through, God is closing up and getting rid of it. I encourage you to focus on Him as He leads us to do, to say, to be All that He desires for us. Remember, don't make any plans other than planning to allow Him to lead you as He knows best. Since we are always expecting More of His best for us, we don't need to make any plans on how to get something done, what to say, or when we need to do anything. Trying to anticipate what you think God is going to have you do next is planning. It is trying to add your thinking and ideas to His, as if His are in need of ours. This will only trip you up and move you out of alignment and obedience with Him. God Is in control of all the details and He has this way of telling us when we need to know, not before hand. This is teaching us to trust Him more, to know that He always has the Best for us whether we know what it is or not, it is the best for us. All we have to do is Seek His Glory and His outcomes, to Rest in His Peace, to Focus completely on Him, to Bring Every thing to Him seeking His Counsel about it, to Continue to radically have faith in Him, to confidently Trust in Him, and to Do what ever He tells us to do, Regardless. It all sounds easy, and actually it's not that hard once we strengthen our gift of self-control and focus our thoughts on Him. Yes, with all the hurdles, potholes, valleys and the mountains, living for Him daily can be a challenge for us if we focus on those and not the Truth that we are following Jesus, the One that knows the Way, remembering that we have nothing to fear at all. Through these challenges the enemy will do what ever possible to deter us, to stroke fear and unbelief in us. He will use anything about us against us, as he is determined to stop the people of God. It makes no matter to him who you are nor how strong your faith is, if you are determined to live your life in the name of Jesus, through God's will, he will always attack, he will come around looking for that crack to enter through. But I heard Jesus say that No Evil shall befall us, and focusing on all that Is Good, remembering that God is the supreme power, nothing the enemy tries will work unless we allow it to do so. Of course the enemy is coming after us, we are a threat to him, and he will use whoever is willing to do his bidding against us. What this does is reveal to us who is actually for us. Being changed by His love from who we were, into who God says we are is a heart and spirit opening experience. It's a never ending healing process that is happening. A daily re-molding process being done to our thinking, our speaking, our actions, and our perspective. It's a humbling process, stripping away all the fleshy ways we have lived through all the temporal things that we have come to rely on, come to lean on and use as our measuring stick. God's processes always give lessons on self-control and taking responsibility for our actions, thoughts and non-actions. It's a daily work for us to use self-control over our flesh so that our spirit is free to lead us, correct us, guide us, use us in our purpose, and is the result of surrendering to His will. Daily He is re-aligning us with His will, plans and purposes so that we are close to Him because, sometimes we do stray off the paths that He leads us on. He is teaching us a new language, a new vocabulary that when used every day will give us the power, wisdom and direction to Speak Life over ourselves and others. 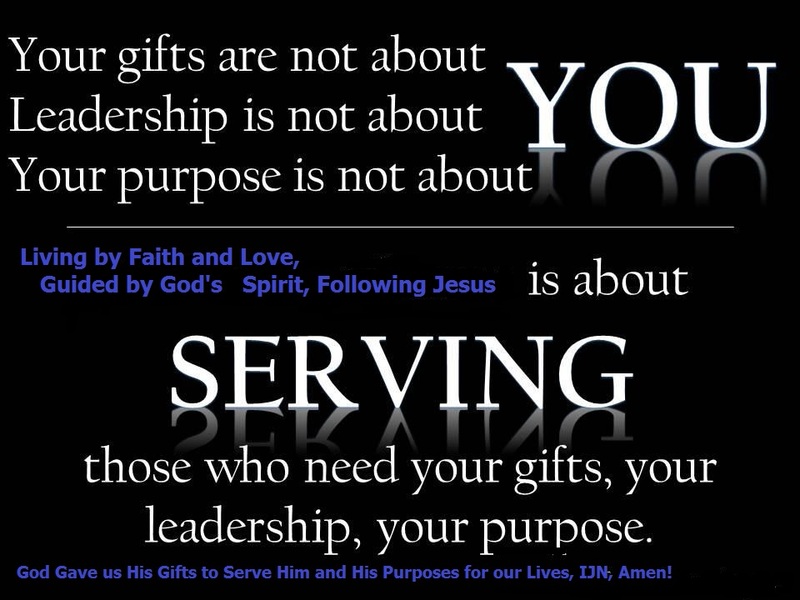 We have been given the gifts, the fruits and the tools of His spirit necessary to do the Work that God's calling on our life is about. We have the teachings of Jesus to direct us and to live by. Learn what He said, you will be lifted up higher than the challenges and troubles. 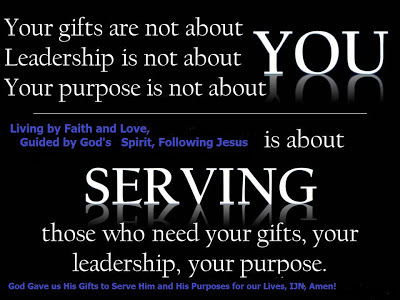 We are being taught How to use the gifts, the fruits, the tools and the teachings of Jesus so that we are effective in our daily journey and so that God's work in us is effective and continues to produce the outcomes He has planned for us. This changing, re-molding, re-aligning work that God does, happens each and every day, a small part at a time. Don't rush the process, you may miss the most important lessons and blessings, as they may be small. Learn to enjoy the days blessings, without focusing on the end of the Work. Thank You Father in the name of Jesus for Your Holy Spirit providing the encouragement, love, wisdom, direction and correction that we desire and need for each day. In the name of Jesus, we appreciate You Lord! This is how I speak Life over, in and through my life, by inserting my name in the Words that hold the Power that makes all the difference in our lives. Put your name in where mine is below as you read this out loud so that you can hear it. So that you will speak God's truth, love, life over yourself, which will enable you to do so in the lives of others. "Lynda, The Way is Open for you to come Boldly before My Throne of Grace. I know you are Not be afraid nor will you hesitate to Come and Let Me Speak to your Heart. To give you All that you need for the days ahead. I have wisdom and direction to impart into you, I have knowledge and healing to pour over and into you! Lynda, Always Listen for My still small voice and you Will hear Me guiding your steps and leading you to accomplish My will and purposes for each day ahead! Lynda, I Will Guide you. I Will Turn the darkness Into light Before you And Make the rough places smooth. I Will Not forsake you Lynda! In All your Ways Lynda, Acknowledge Me, And I Shall Direct Your Paths! Lynda, Give, and the gifts Will be Given to you; Good measure, pressed down, shaken together, And running over, Will They Pour Into the pouch formed by the bosom of your robe Used as a bag! Lynda, for with the measure you deal out, with the measure you use when you confer benefits others, It Will Be measured Back to You! Lynda, According to your faith, Be It Done Unto you!"